Jared Unzipped: What Happens To The Human Body After We Die? We've all seen crime scene investigators on television describing the human body in various states of decay. They'll toss out a plethora of terms and phrases to describe what is happening... but how do we know what they're saying is correct? This got me to thinking. What exactly happens to the human body after we die? Of course, I mean this in a very literal sense (discussions on the afterlife are a whole different article entirely). I present to you... the stages of death in the human body! Within the first hour after death, the human body relaxes. All of the muscles become flaccid and loosen up. This period is called primary flaccidity. Your skin also becomes saggy and droops. All of the blood in your circulatory system drains from the smallest vessels and begins to pool inside the body. As such, the skin loses its warm glow and becomes remarkable pale. This step is known as pallor mortis. With the blood not moving anymore, the human body's temperature begins to drop and match that of its environment, known as algor mortis. This drop in temperature is fairly linear. Forgoing any extreme levels of heat, cold or humidity, an investigator or mortician can roughly determine how long a person has been deceased based upon how cold they are. Two degrees Celsius (3.6 degrees Fahrenheit) are lost in the first hour, with one degree Celsius (1.8 degrees Fahrenheit) lost for every hour after that until the room temperature is met. By hour two, the body has started to look fairly strange. All of the blood that has begun to pool in the body has gravitated to the lowest resting point, a step labeled as livor mortis. For example, a person whom died on their back will naturally pool all of the blood supply towards their backside. The massive amounts of blood will turn the skin in the area red and purple. This coloration is called the postmortem stain. Roughly three hours past death, the human body begins to stiffen, commonly known as rigor mortis. The first areas to stiffen are along the neck and jaw, as well as the eyes. Over the course of three more hours, the stiffening spreads from the face to the abdomen, then to the arms and legs. The final areas of the human body to experience rigor mortis are the fingers and toes. The level of rigidness the body experiences will continue to build for approximately twelve hours after death. Obviously, various factors like heat and position can affect this process slightly, whether faster or slower. 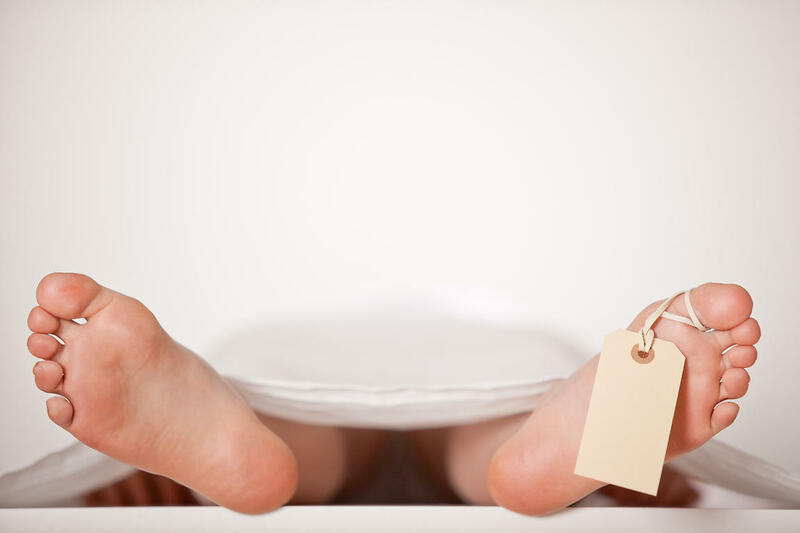 By the end of rigor mortis, the body is very difficult to move. Arms and legs will be all but impossible to flex. Hands and fingers make take on a gnarled appearance. After reaching a peak level of inflexibleness, the muscles within the human body then begin to decay. Beyond twelve hours post death, the joints and limbs slowly begin to loosen up again, called secondary flaccidity. Between one and three days later, rigor mortis disappears in reverse order. If a body is left in a cold environment, this process will take longer than normal. If left in a warm area, the process will be expedited. When it's all said and done, the body will once again be flexible and relaxed. Now, if you ever come across a dead body, you'll roughly be able to tell how long it has ceased to function!